For example, are there systems in place to protect critical infrastructure? Does it allow for continuous improvement of the built environment and flexibility in use over time? For example are there monitoring and feedback systems in place? Do ownership and tenure arrangements allow for future upgrading, reuse and possible redevelopment? Has the development been certified through a sustainability rating system? Are strategies in place to reduce water consumption and provide for water re-use? Are strategies in place to reduce energy consumption, promote energy efficiency and/ or generate green energy? Does it consider the whole of life-cycle of buildings, materials and waste disposal? Is the use of local goods and services encouraged? Does the design minimise the operation and maintenance costs over time? Does it reduce the environmental impact of waste? For example, through waste reduction and management at pre-construction, construction, operational and demolition stages. Does it impinge or impact on the ongoing viability of other economic activity? For example residents requiring reduced operational hours for noise mitigation. Is it clear who is responsible for long-term management and upkeep, including possible upgrading and reinvestment? Is there a management plan for the place, and is it adequately resourced and monitored? Are strategies in place to improve its resilience to the changing climate and natural disasters? Does the design incorporate energy saving and low greenhouse gas technologies? 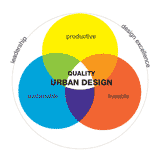 A report making the case for better urban design practice in New Zealand (New Zealand Ministry for the Environment, 2005). A report outlining minimum standards and monitoring requirements for achieving sustainable buildings and towns (Bio-Regional and CABE, 2008).